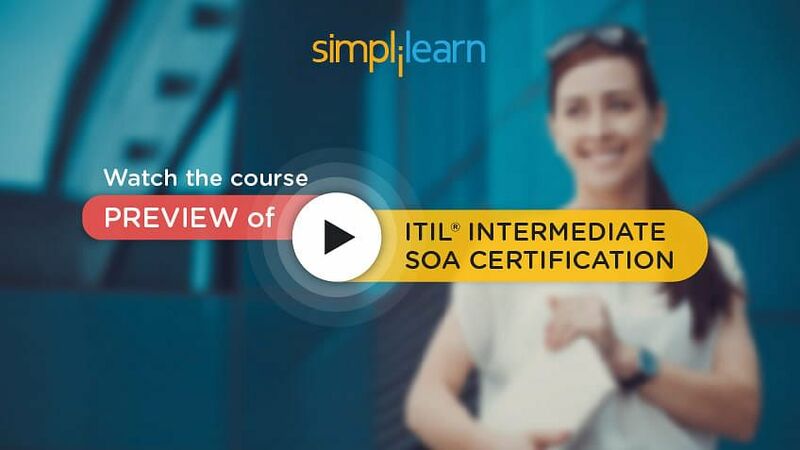 Welcome to lesson 9 ‘SOA Roles and Responsibilities’ of the ITIL Intermediate SOA tutorial, which is a part of the ITIL Intermediate SOA Foundation Certification course. This lesson deals with the roles and responsibilities which contribute to SOA practices. Describe the responsibilities of the various roles which are associated with each SOA process. The process owner role is accountable for ensuring that a process is fit for purpose. This role is often assigned to the same person who carries out the process manager role, but the two roles may be separate in larger organization’s. The process owner role is accountable for ensuring that their process is performed according to the agreed and documented standard and meets the aims of the process definition. Making improvements to the process. In the next section, we will learn the process manager’s accountabilities. You too can join the high earners’ club. Enroll in our ITIL Intermediate SOA Course and earn more today! The process manager role is accountable for the operational management of a process. There may be several process managers for one process, for example, regional change managers or IT service continuity managers for each data center. The process manager role is often assigned to the person who carries out the process owner role, but the two roles may be separate in larger organizations. Making improvements to the process implementation. The next section will explain the responsibilities of process owner as well as the manager for service portfolio management. Working with other process owners to ensure there is an integrated approach to the design and implementation of service portfolio management. Helping formulate service packages and associated options, so that services can be combined in logical groupings to produce products that can be marketed, sold and consumed to best meet customers’ needs. Let us discuss the key roles of process owner as well as process manager for Service Catalogue Management. This section describes some roles that need to be performed in support of the service catalog management process. These roles are not job titles, and each organization will have to define appropriate job titles and job descriptions depending on its needs. Working with other process owners to ensure there is an integrated approach to the design and implementation of service catalog management, service portfolio management, service level management, and business relationship management. Carrying out the generic process manager role for the service catalog management process. Ensuring that the information within the service catalog is adequately protected and backed up. In the next section, let us discuss the main roles and responsibilities of process owner for Service Level Management. This section describes some roles that need to be performed in support of the service level management process. These roles are not job titles, and each organization will have to define appropriate job titles and job descriptions depending on its needs. Working with other process owners to ensure there is an integrated approach to the design and implementation of service catalog management, service portfolio management, service level management and business relationship management. Let us learn some additional responsibilities of process manager for the service level management in the next section. Looking for more information on ITIL Intermediate SOA? Click to watch our Course Preview now! In the next section, we will look into the roles of the process owner and process manager in support of the demand management process. This section describes some roles that need to be performed in support of the demand management process. These roles are not job titles, and each organization will have to define appropriate job titles and job descriptions for their needs. Works with other process owners to ensure there is an integrated approach to the design and implementation of demand management. Gears the utilization of resources that deliver services to meet the fluctuating levels of demand for those services. Let us now discuss the key roles for Supplier management process owner and process manager in the next section. This section describes some roles that need to be performed in support of the supplier management process. These roles are not job titles, and each organization will have to define appropriate job titles and job descriptions depending on its needs. Working with other process owners to ensure there is an integrated approach to the design and implementation of supplier management, service level management and corporate vendor management and/or procurement processes. Let us learn some additional responsibilities of Supplier process manager. Coordinating and supporting all individual IT supplier and contract managers, ensuring that each supplier/contract has a nominated owner within the service provider organization. The next section will describe the responsibilities of the process owner and the process manager for the financial management for IT services. This section describes some roles that need to be performed in support of the financial management for IT services process. These roles are not job titles, and each organization will have to define appropriate job titles and job descriptions for their needs. Many organizations will have a person with the job title ‘IT financial manager.’ This job typically combines the roles of financial management for IT services process owner and financial management for IT services process manager. Works with other process owners to ensure there is an integrated approach to the design and implementation of financial management for IT services. Examines and reports on value-for-money of all major activities, projects, and proposed expenditure items within IT. Reports budget activities and outcomes on a regular basis. The next section will explain what does the job title of Business relationship manager means, the responsibilities of process owner and process manager for the business relationship management process. Thinking about investing in ITIL Intermediate SOA Certification? Check out our Course Preview here! This section describes some roles that need to be performed in support of the business relationship management process. These roles are not job titles, and each organization will have to define appropriate job titles and job descriptions for their needs. Many organizations will have a person with the job title ‘business relationship manager’ (BRM). This job may combine the roles of business relationship management process owner and business relationship management process manager and allocate it to one person. ‘Business relationship manager’ may also represent some individuals working within business relationship management and focused on different customer segments or groups. In some organizations, this role may be combined with the role of service level manager. There can also be confusion between the role of the BRM, and the process of business relationship management. Business relationship managers are often required to execute activities from other processes simply because of their customer-facing position. This does not make those activities part of the business relationship management process. Working with other process owners to ensure there is an integrated approach to the design and implementation of business relationship management. Mediating in cases where there are conflicting requirements for services from different business units. We have already covered the various roles and responsibilities needed to execute the SOA activities in this unit. Let us go to the next lesson to discuss the SOA Technology and Implementation Considerations.